Whoever said that baking is a science wasn’t kidding. I learned that the hard way in the process of creating the recipe I’m offering today. It took me somewhere between six and nine tries (at some point I lost count) to get it right. I wanted to make a sugar- and gluten-free version of an old favorite: the banana muffin. I took as my starting point a traditional recipe (read: one with wheat flour and lots of sugar) and brainstormed ways to adapt it. The problem is, when you change one thing, you risk throwing off the entire recipe. It’s not like cooking where you can take a lot of creative license with little risk. The first thing I knew I wanted to do was substitute almond flour for the white wheat flour. Google told me I could substitute these 1:1 if I increased the leavening agents, but it failed to offer details. My recipe called for three leavening agents – eggs, baking soda, and baking powder. Was I to increase one, two, or all three of them? And by how much? There were other unanswered questions too. I planned to entirely remove the sugar, but should I replace it with something? If so, what, and how much of it? 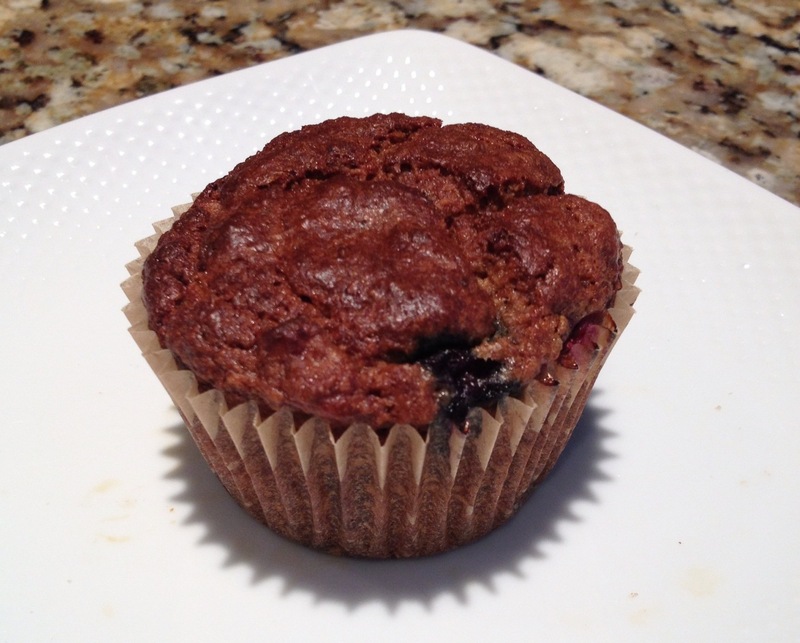 If you’re watching your calories, you’re saving almost 100 of them with the sugar- and gluten-free muffin. Thanks to the almonds, the new muffin offers twice the amount of protein, half the amount of saturated fat, and three times the amount of fiber as the old one. And while the old muffin has 27 grams of sugar, the new one has only 5 grams, all of which are natural sugars that come from the fruit. The chart above doesn’t say anything about vitamins and minerals. If it did, the new muffins would again be the clear winner. The almond flour is loaded with ‘em, including vitamin E, manganese, magnesium, and copper. The white flour used in the old muffins is essentially void of all these goodies. There you have it! Give the recipe a shot and tell me what you think! Line a muffin tin with the baking cups and set aside. Mash bananas in a medium-sized bowl, using a fork or potato masher. Mix in egg yolk, oil, and vanilla. In a separate bowl, blend almond flour, baking soda, baking powder, salt, cinnamon, and nutmeg. Gently add the dry ingredients to the wet ingredients, stirring just to combine. Fold in blueberries and egg whites, again stirring just to combine. Divide batter evenly among the lined muffin cups and bake for 30 minutes. Previous postWhy You Should Deadlift – Even if You’re Pregnant!